Community Financial Money Matter$ Blog: Tis the Season of Giving! Community Financial is donating over $50,000 to local schools and non-profits. Tis the Season of Giving! Community Financial is donating over $50,000 to local schools and non-profits. Our Season of Giving campaign has just kicked off! On behalf of our members, Community Financial Credit Union is donating over $50,000 to local non-profits and schools throughout the month of December. In the spirit of the holidays, each organization will be surprised with a donation from Community Financial. 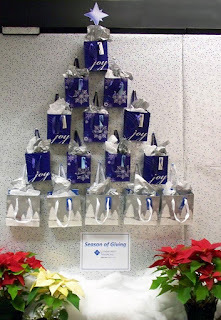 The gifts will be kept under Community Financial's giving tree. Join us on Facebook where the winners will be announced every weekday! Gift recipients so far include The Ostego County Community Foundation, Gaylord area schools, Hillman and Atlanta area schools, JoBerg/Lewiston area schools and the Community Foundation of Northeast Michigan. Community Financial Credit Union is a not-for-profit institution that gives back to the community. To learn more about upcoming programs and community events connect with us on Facebook and Twitter.